"The RS3's performance stems from a balanced combination of elements. True performance has many dimensions..." Jack Roush Jr. There is nothing quite as intense as the raw power of a 5.0L V8 engine. Add ROUSH Performance's new 2016 2.3L TVS supercharger to the mix, and you've got a 670HP beast on your hands. 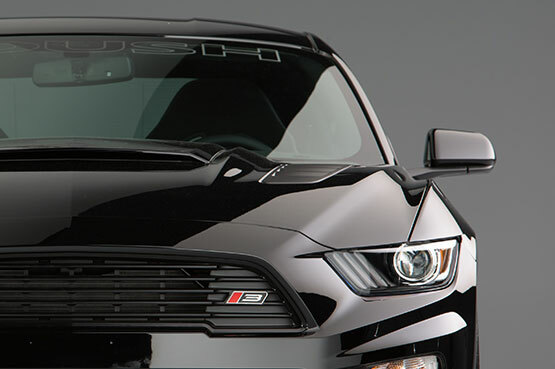 The 2016 Stage 3 Mustang is a force to be reckoned with. The 2016 ROUSH Stage 3 Mustang is the most powerful and well-balanced production Mustang to launch out of the ROUSH Performance garage. For starters, standard features include a ROUSH Quad-Tip exhaust (with the ROUSH Active Exhaust System as an optional add-on), and of course, the fierce new "R7" aerobody, complete with graphics and badging. Twists and turns are no match for the RS3, which comes equipped with a standard single adjustable coilover suspension system, with an optional competition-tuned 3-way adjustable system available. The 2016 ROUSH Stage 3 is truly the ultimate in American muscle. Jack Roush's vision shines through this perfect combination of raw power and meticulous handling and braking capabilities, providing the driver access to the robust attitude and performance of a racecar, while maintaining a comfortable and uniquely ROUSH driving experience. ROUSH is a name synonymous with high-horsepower, fiercely-competitive Ford vehicles. The ROUSH Mustang is powered by the culmination of decades of racing experience and ROUSH heritage, and the 2016 ROUSH Stage 3 Mustang continues that tradition. 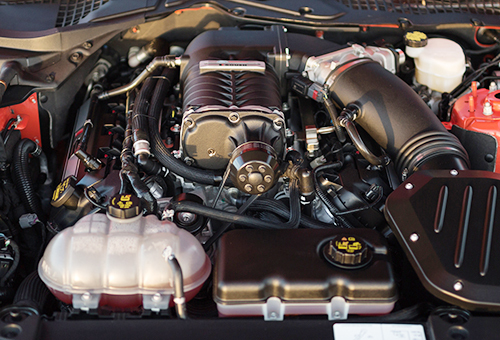 With a ROUSHcharged Coyote 5.0 under the hood, the 2016 ROUSH Stage 3 has more horsepower-per-liter than any other OE American muscle car, while maintaining an unrivaled level of driveability. You can hear the Stage 3's power pulsing through an innovative new ROUSH Active Performance exhaust system. This game-changing system gives full control over the volume and tone coming from a Quad-Tip Stainless steel ROUSH exhaust. Select modes ranging from the subtle "touring" mode, dynamic "sport" mode, and wide-open "track" mode. With the "custom" mode you can program your own dynamic profiles with virtually infinite sound possibilities, right from your mobile device. ROUSH has gone to great lengths to enhance the appearance and functionality of the ROUSH Stage 3 Mustang to provide true race-inspired body, graphics, wheels, and grille work. ROUSH exterior upgrades are precision engineered with CAD/CAM design and manufactured with the same processes that the big automotive manufacturers use for OE-quality appearance, longevity, and fit. The 2016 Stage 3 Mustang embodies the legacy of ROUSH Performance's racing heritage. 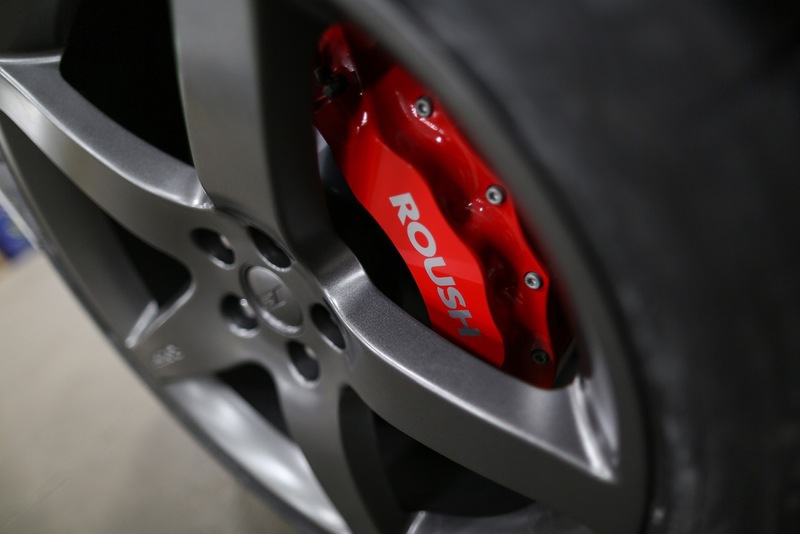 The experience gained through ROUSH racing programs is integrated into every ROUSH Mustang's chassis, making the 2016 Stage 3 the best-handling ROUSH Mustang yet. Taking full advantage of the 2016 Mustang's all-new independent rear suspension and pairing it with a standard height adjustable coilover suspension makes for the ultimate balance of performance and streetability. The optional three-way adjustable TrakPak coilover suspension allows for adjustment of height, compression, and rebound, allowing you full control over your Stage 3 in the corners. At ROUSH Performance, it's not enough to deliver heart-pounding performance, unparalleled refinement, and race inspired styling. We take a step further and back-up the 2016 ROUSH Stage 3 Mustang with an industry-leading 3-year, 36,000 mile limited warranty to show you that we are with you on this ride.